8 pcs outdoor camping pot set,practical and multi-functions. Foldable handles on pot,frying pan and soup spoon.They can be folded in small size to save space. Portable: Coming with a mesh bag,all the cooking set can be stored in it.Very convenient to carry. 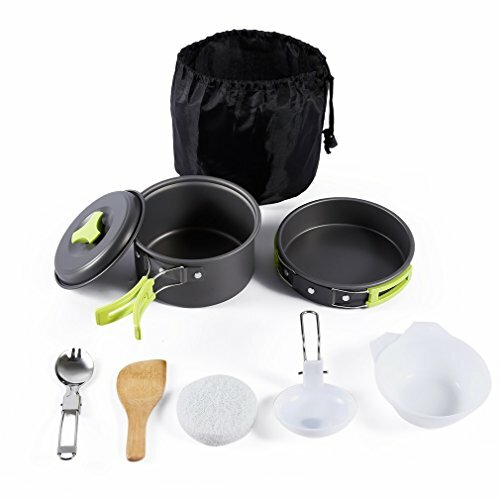 Camping Cookware Mess Kit includes aluminum nonstick pot (1.06 Liter Capacity),pot cover,frying pan (about 0.66L),2*bowls,folding stainless steel spork,a soup spoon,wooden spoon spatula,cleaning Sponge ,storage bag.